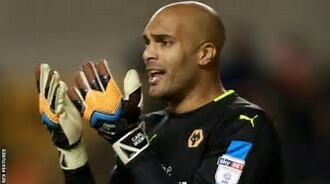 The Super Eagles have been dealt a major blow as first choice goalkeeper Carl Ikeme has been diagnosed with acute leukemia. The 31-year-old Wolverhampton of England shot-stopper was said to have tested positive to the disease upon resumption for pre-season training and further test also confirmed the diagnosis. The Nigerian international recorded 33 appearances for Wolves last season, having played for than 200 times for the Championship side. “It would be an understatement to say that everyone at Wolves has been shocked and saddened to hear the news of Carl’s diagnosis,” the club’s managing director, Laurie Dalrymple, said. “That relates to both players and staff as Carl has been at the club for a very long time and remains such an integral personality within the group. “At the same time, we all know what a fighter and a competitor Carl is, and I have no doubt that he will take all of those attributes into this battle. “Similarly, its goes without saying that Carl and his family will receive the full love and support that we at Wolves can provide. Clubs, players and coaches have been pouring in their support for the 31-year-old, wishing him a speedy recovery.